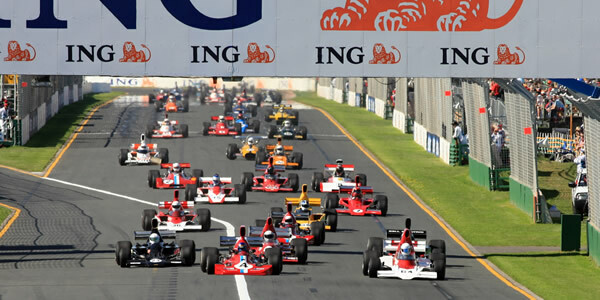 The growing profile of the F5000 Tasman Revival series was finally rewarded in March 2009 with a support race at the Australian Grand Prix meeting. This drew a huge field of 32 cars, including 18 New Zealanders, nine Australians, four from England including three members of the Lyons family, and a solitary American. Ten constructors were represented, and the models of car ranged from the Begg FM2 of 1969 to the Elfin MR8 of 1977. Chris Hyde only appeared at the opening race of the 2008/09 season, leaving Kenny Smith to win most of the races from then on. He was challenged by Canadian Jay Esterer who had brought a McRae GM1 with him and won a race at the Lady Wigram Trophy meeting, and also by Englishman Mark Dwyer, who had brought over his Lola T400. Other new cars in 2009 included the Elfins of Tony Floreani (MR5), Paul Trevethan (MR6) and Ken James (MR8); and a Lola T332 raced by Ian Clements that remains sadly unidentified. Although Chris Hyde won the feature race at the opening round, he does not appear in the pionts table. According to official points keeper Tony Richards, Hyde was standing in for Stuart Lush who was unwell, so was not eligible for points. A total of 29 F5000 Tasman Revival events had taken place by the end of this season. The drivers who had taken part in the most were as follows. Ross MacKay of Fast Company has been working consistently for 14 years to publicise the work of the New Zealand Formula 5000 Association, and his regular emailed press releases are the primary source of information for these results. The cars are of course identified from work presented elsewhere on this site. Series co-founder David Abbott has been a constant source of information about the series, the cars, and their owners, and his assistance is gratefully acknowledged. Kevin Thomson has kindly allowed the use of his photographs, both here, and throughout the site. Thanks also to Fast Company for providing photographs for press use from a range of photographers.